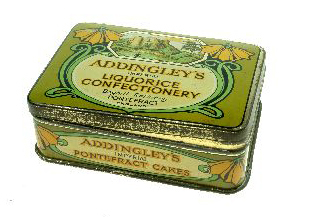 Liquorice tin in an 'art nouveau' style from about 1900. The castle ruins are shown after the Victorians have turned the site into a park. The top of the keep shows a 'window' shaped hole which was knocked through the archaeology to create a distant view of St. Giles. The weakened wall later collapsed.